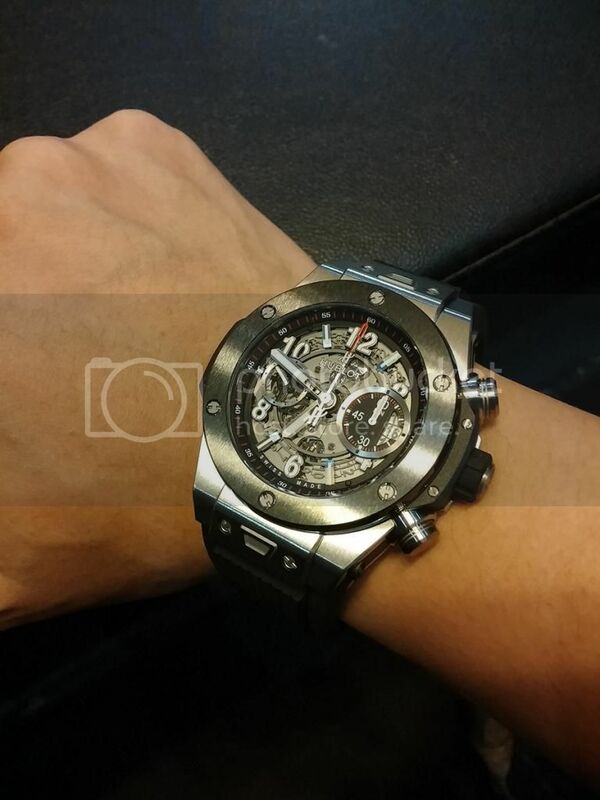 as i posted before a few days ago, long story short: i saw the unico last weekend and was blown away by it, in the process to decide to buy it, my watch buddies advised me to get the ROO 2014 instead, so i was thinking hard in choosing between AP ROO 2014 black or the hublot unico big bang. both are awesome and i do like them both in their own 'personality'. as the title says, in the end i chose unico, and it didn't take too long for me to decide(fortunately, else losing too much sleep over this lol). 1. heart over head, or head over heart, or both in unison? in my heart i like the bold design of the unico better. the skeletonized dial is really something to be seen in person. pictures just don't do it justice. you must see it in person. it is such a pleasure to see it on the wrist. when i found out Mr.Biver actively posts here, and his actions including on the broken bezel case on another forum topic. it blew me away. to be able to communicate directly with the CEO of a watch brand alone is already awesome. to have handwritten thank you note alone is already awesome. yet Mr. Biver goes beyond all that. addressing issues from various members, providing extended warranties, etc. this is a big factor for me. from my discussion with the seller(same seller for both AP ROO and unico) who's my friend, he shared many information to help me deciding which watch to get. to recap in shorter version: if resale value is more important, get the ROO. if seeking for movement robustness, get the unico. it was his experience to have ROOs fail in different cases/problems and have to send it back to have it fixed. yet he had not did it once for hublot. ok maybe the ROO sell much more, but failure rate percentage wise, it's a clear difference. however, it was his experience both brands provide excellent customer service via boutique and service center. ceramic bezel. honestly for the price of ROO 2014, they should have been released with ceramic bezels instead of all steel, we all know how easily scratched the steel bezel are. ceramic bezel on the unico solves that for me. skeletonized dial, ceramic bezel, in-house movement with some of high end technology(pellation winding, silicon escapement, double clutch column wheel, 72hr power reserve, flyback chrono function), aggresive design, priced competitively against other similar products. at this rate, i think the unico will grow popular and the day pricelist discount control(as enforced by many other brands) would be coming too for hublot. i've seen in the years that it improves resale and perceived value of various brands when they went with in house movement route(example: omega, iwc). 6. most importantly of all, the satisfaction factor! 1. the detachable strap system seems a bit kind of risky, if this should fail, ie: either the clutch/lock, or the flat insert planted on the rubber strap, then the whole watch would fall off the wrist without warning. 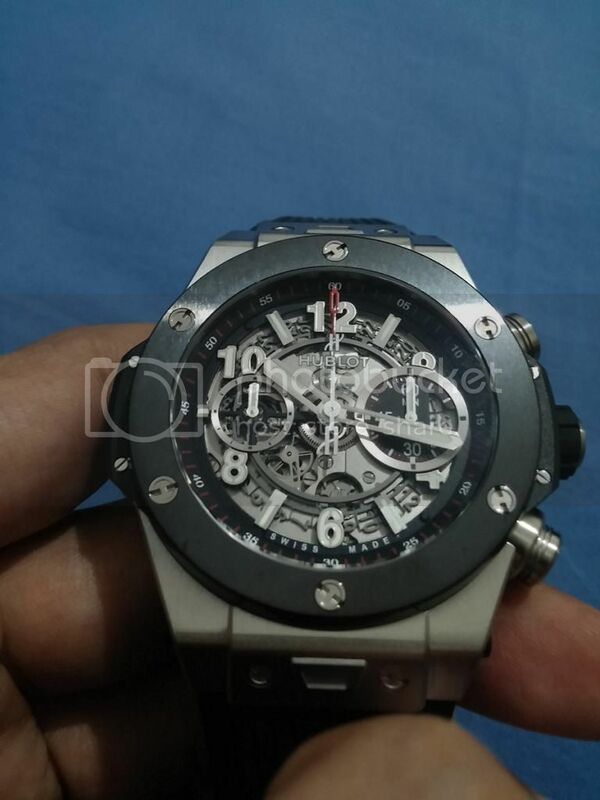 i hope this will never happen to any hublot watch produced with this system, ever. 2. i kind of timed the movement for fun/initial timing, last night after setting it to my digital casio. i placed it down, in crown up position, then i check on it again after approx 12 hours, i was surprised to find out the watch is running fast +9 to +10secs. then i left it at home today, came back at night and when i checked again almost 24 hours after time set, and it's running fast +13 to +14secs. other watches i currently or have owned before(rolex, omega, iwc, panerai) ran more accurately out of the box. with the exception of JLC which ran fast +20ish/day and then settled down to a more acceptable rate of +7ish after a couple weeks. i hope the unico will settle down too, seems so to me that is the case(from the first 12 hours running +9 to +10, to the 2nd 12 hours running +4 to +5). moreover, i hope it will have the same stable rate between resting(placed down) and on the wrist. plan to wear it on this weekend, will find out later. i think i may have been overly excited with my new watch and written a mini review instead of just answering Todd's question on my previous topic. 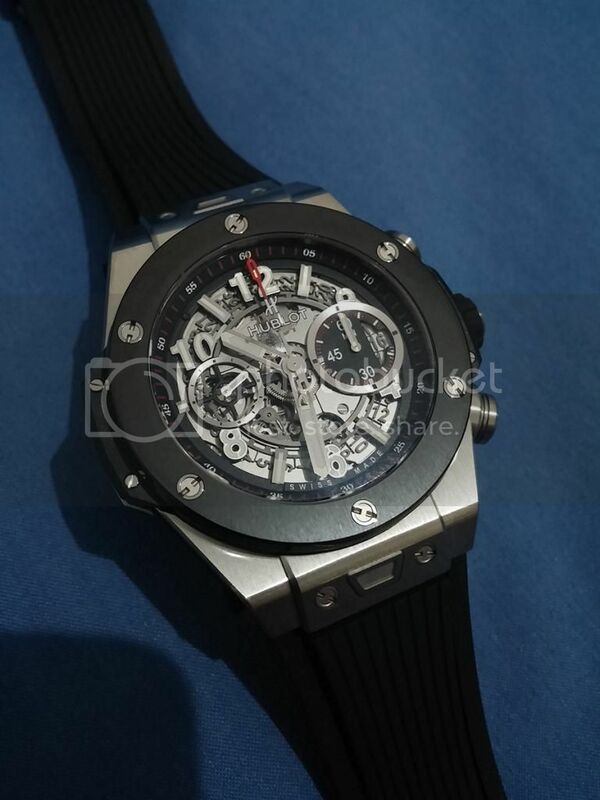 and i think Hublot's excellent offering of the the Big Bang unico in 45mm will be a big success. thanks for reading and i hope you everybody a good health and success in work. Next Topic: Hublot private auction raises CHF 1 million for Chinese charities.